The JavaMail API provides a platform-independent and protocol-independent framework to build mail and messaging applications. The JavaMail API is available as an optional package for use with Java SE platform and is also included in the Java EE platform. The JavaMail 1.4.5 release contains several bug fixes and enhancements. Sometime back I’ve written a Tutorial on Send an email using Gmail SMTP (TLS Authentication), but without Image Attachment. Below Java Tutorial will help you send a Large Image with an email as an attachment. Sometimes we want to attach an image in the email and then use it in the email body itself. You must have seen so many emails that have image attachments and are also used in the email message. The trick is to attach the image file like any other attachment and then set the Content-ID header for image file and then use the same content id in the email message body with <img src='cid:image_id'>. 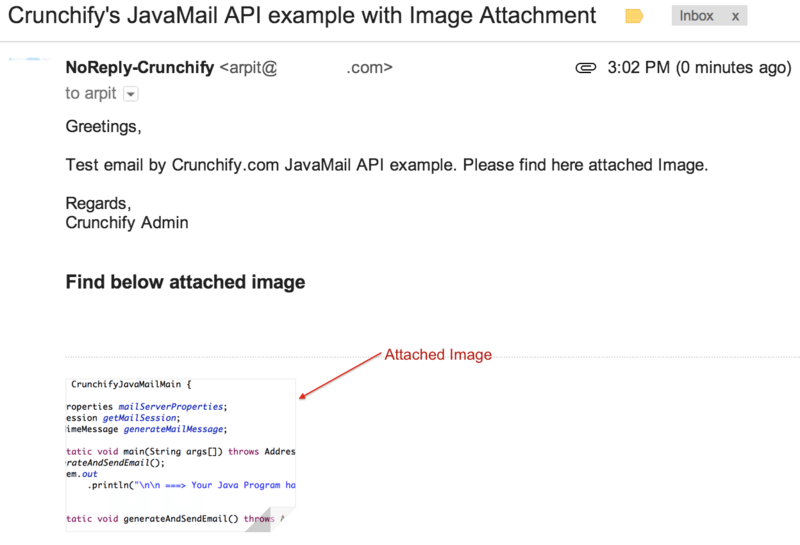 "Greetings, <br><br>Test email by Crunchify.com JavaMail API example. Please find here attached Image." 1st ===> setup Mail Server Properties..
2nd ===> create Authenticator object to pass in Session.getInstance argument..
4th ===> third part for displaying image in the email body..
5th ===> Finally Send message..
6th ===> Email Sent Successfully With Image Attachment. Check your email now..
How to setup email for Discourse Forum with Google Apps SMTP-relay right way? Your example works for fixed path. But how did you pass the relative path when the images are in “/go/images/abc.png” location in your WAR file. in java web project. I tried a multiple things but it didn’t work. Do you have any way to do it. 3. Set it as a setContent() in above example. Make sure you use your hosted image URL in email template. ya i have done like that but when mail is sent that time it will be only 1 product image & detail sends, i want this newsletter like we get from snapdeal & flip-cart product details in mail. if you have any example code so please can you send me.?? eagerly waiting for you update…..! I am seeing the image in text as shown in the attachment below, is there anything else I need to do ? I am using my gmail ids for testing, rest all is same. Hi Pradeep – I believe this is because Content-Type header “text/plain”. It should be “image/gif” or “image/png” or “image/jpeg” etc. Also, which email client are you using? After I added this line messageBodyPart.setHeader(“Content-Type”, “image/png”);, I am still getting similar response, no attachment, but text in the message body. Pradeep – where are you seeing this? R u seeing this on gmail.com? Yes, but it happens only with my acer machine, when I tried on a different one, it worked fine(was able to see html content in the email body with attachment properly), may be it is just an encoding issue. might be.. sorry couldn’t help much. You are welcome.. Thanks for posting..